Norwegian politician and NATO Secretary General Jens Stoltenberg announced on Wednesday that NATO heads and allies have agreed to meet at a summit set to take place this December in London, signaling the return of President Donald Trump to the U.K.
"The meeting in London will be an opportunity for Allied Heads of State and Government to address the security challenges we face now and in the future, and to ensure that NATO continues to adapt in order to keep its population of almost one billion people safe," Stoltenberg said in a statement. The secretary general's words come after Trump has focused on bolstering its defense budget. He has previously insisted to NATO allies that they need to double their target for military spending, hunkering down on contributing at least 2 percent of each country's gross domestic product and later doubling it to 4 percent. Trump has also been an overall outspoken critic of NATO, a military alliance between 29 member states that was created in 1949. He has frequently distorted an imbalance of spending. The announcement of the scheduled conference comes in the wake of the annual State of the Union address, which Trump delivered Tuesday night to mixed results. During the speech, Trump derided NATO for what he categorized as unfair treatment of the U.S.
"For years, the United States was being treated very unfairly by friends of ours — members of NATO," Trump said. He then took credit for an uptick in defense funding. "We have secured, over the last couple of years, more than $100 billion of increase in defense spending from our NATO allies. They said it couldn't be done," Trump said. While fact-checkers confirmed Trump's claim, many noted that the U.S. push for defense spending stemmed from the Bush and Obama administrations. The meeting will mark Trump's second official visit to the U.K. The last visit took place over four days in July and was marked with mass protests against the U.S. leader's policies and after describing Brexit as "a wonderful thing" for the U.K.
Online research firm Statista released data in July that showed British perceptions of Trump were mostly negative. Sixty-three percent of responders said Trump was making the world a more dangerous place, while only 22 percent said he was doing a good job as president. Trump continues to have poor approval ratings in Europe, a fact that was brought up by Utah Sen. Mitt Romney in January in a Washington Post opinion piece. "In a 2016 Pew Research Center poll, 84 percent of people in Germany, Britain, France, Canada, and Sweden believed the American president would 'do the right thing in world affairs.' One year later, that number had fallen to 16 percent," Romney wrote. Patrick Wintour, the Guardian's diplomatic editor, described the summit as "an event that will see Trump’s credentials as an Atlanticist back under scrutiny." Wintour also noted that "Trump is expected to praise [Brexit] on the trip, and to attract protests and controversy" and that "Downing Street is unlikely to be able to afford Trump a state visit." 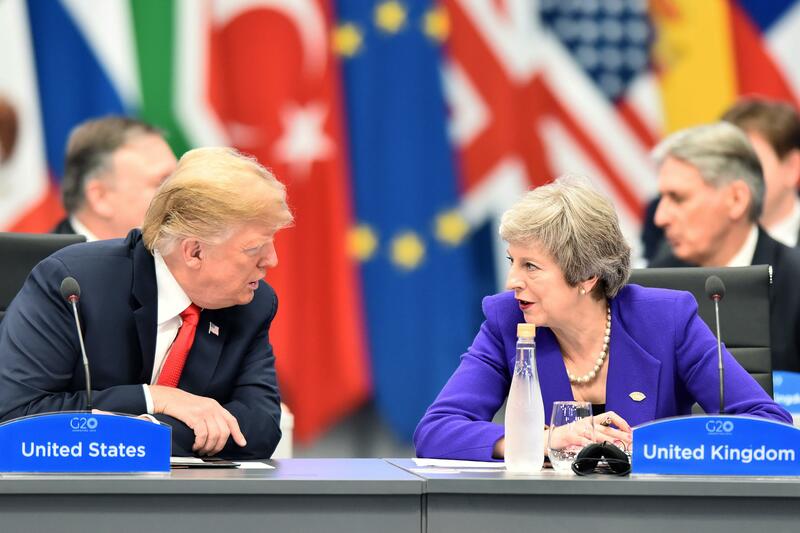 The summit will also honor NATO's history, returning to the city where the organization held its first meeting in 1949, which British Prime Minister Theresa May noted in her remarks on the summit. "The U.K. is one of the founding members of NATO and I am very pleased that the secretary-general has asked us to host a meeting of NATO leaders this year to mark its 70th anniversary," May said.